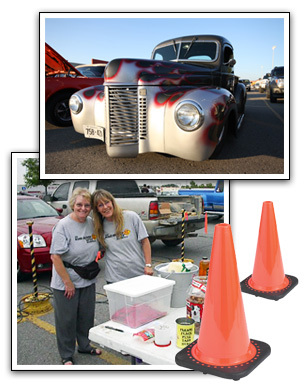 In 1995, three couples sat down and decided to form a car club for the Orangeville area. The intent of which was to improve the cruise night that existed and to have a multi-voiced say about proposals that the government was attempting to initiate at the time. The club has been run from the second year on by a five person executive group who discuss ideas rather than just voting on them. We have one general meeting each fall and the members are welcome to voice ideas and suggestions, but they are not obliged to even show up if they choose not to. We are always mindful that this is their hobby not their job. Membership has grown fairly steadily over the years not sits at over 100+ members in the club. The cost to join is $20.00 and you receive a t-shirt with your membership. We also do a few events that are only for the members and their families or friends. We have a spring BBQ on the may 24 weekend and after the season is over we have a big roast beef get together. We also try to meet for dinner out, at a different restaurant once a month over the winter, just to stay in touch. We also do a car show each fall for the orangeville agricultural society for their fall fair. We also try to put a float in the local Santa Claus parade each year if we are able. Our cruise nights are Wednesday Evenings from 6:30 to dusk. We try to be very consistent with our draws at 8:30pm as we understand that most people have to work the next day. We try to always remember what it was like when we went to someone else’ cruise night for the first time, so we hope that we make everyone that comes out, feel comfortable and welcome. We are still having lot of fun and we hope that it shows on our Wednesday cruise nights.